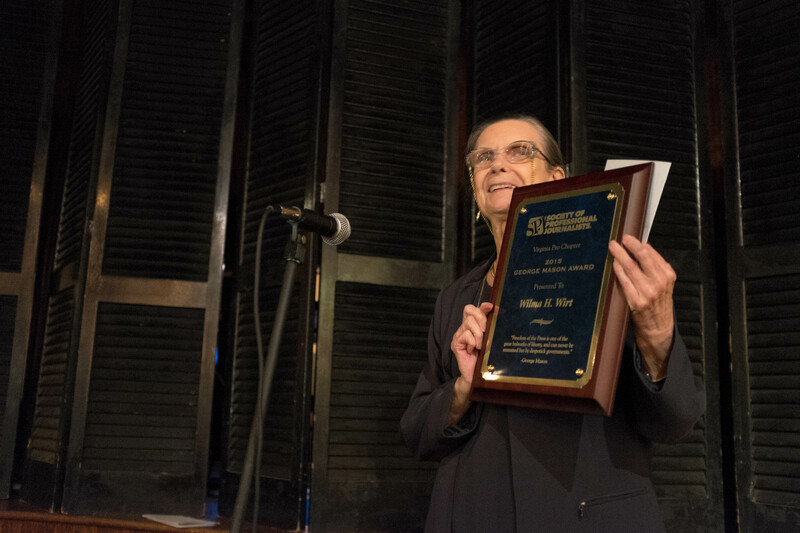 The Virginia Pro Chapter of the Society of Professional Journalists honored retired Virginia Commonwealth University professor Wilma Wirt Wednesday night in Richmond. Wirt is the 52nd winner of the annual award honoring journalists for their contributions to Virginia journalism. Wilma Wirt accepts the George Mason Award in Richmond on Sept. 9. 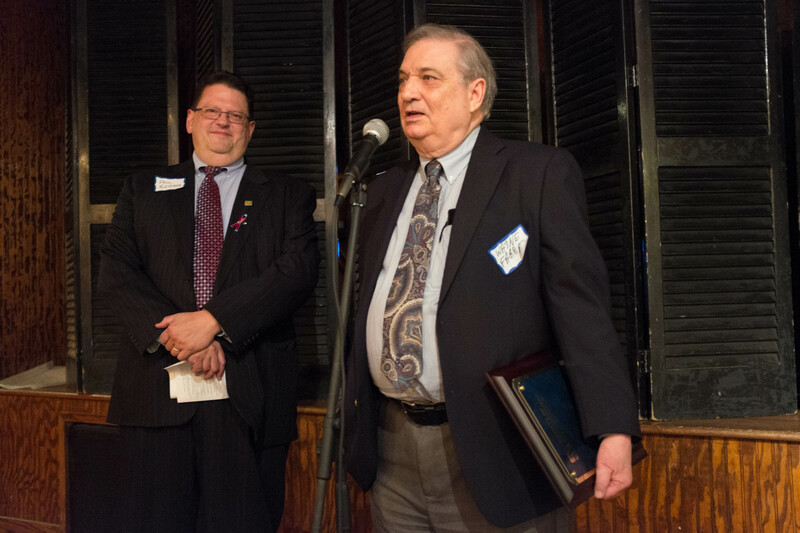 The chapter also awarded Wayne Farrar, the recently retired news director of WCVE, the George and Francine Crutchfield Distinguished Service Award. Past Chapter President and National President-Elect Paul Fletcher presents Wayne Farrar with the George and Francine Crutchfield Distinguished Service Award Sept. 9. The SPJ/SDX Foundation presented two Virginia undergraduate journalism students with fellowships. Athena Cao is a senior at Washington & Lee University and won the Virginia SPJ/SDX Fellowship. Tyler Byrum is a senior at George Mason University and was awarded the George T. Bowles Memorial Fellowship. Cao spent her summer interning at The Charlotte (N.C.) Observer and Byrum spent his summer at WAVY-TV 10 in Hampton Roads. Finally, the society elected new officers for the 2015-2016 year. The board members who attended Wednesday were (from left) Caroline Cardwell, Shawn Day, Robyn Sidersky, Greg Gilligan, Nicole Livas, Jeff South, Wayne Farrar, and Peter Vieth. 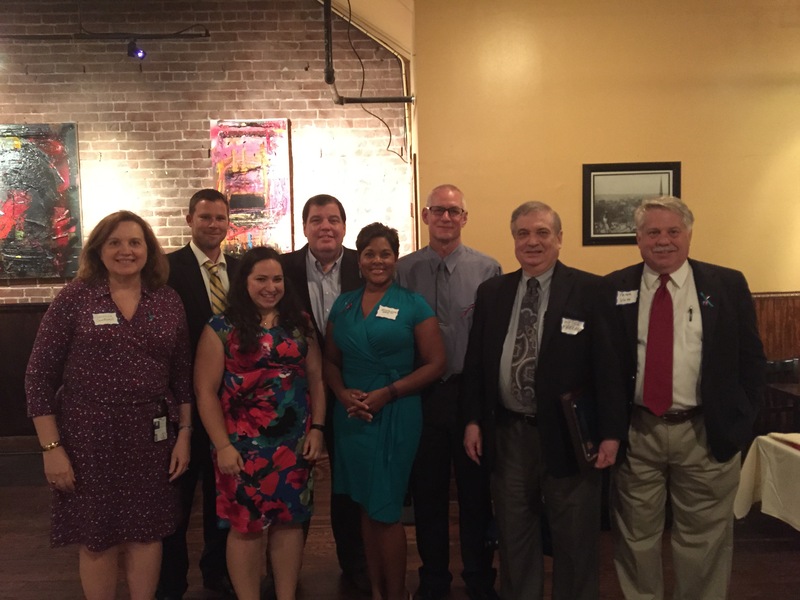 Two board members were also elected to serve on the SPJ/SDX Foundation Board. Dorothy Abernathy of the Associated Press, and Caroline Cardwell of the Virginia Retirement System, will serve through 2018.